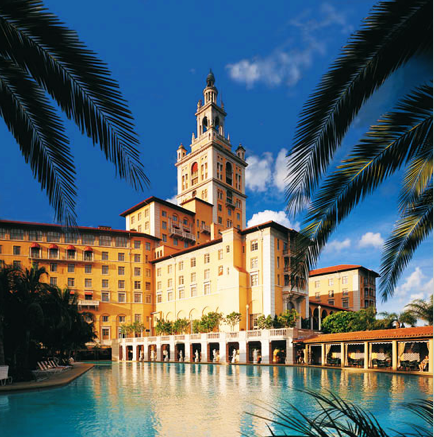 The Florida of yesteryear, the 1920s to be exact, is what the Biltmore Hotel, the grand estate property of Coral Gables, represents. This place is a true escape to another era, a la Great Gatsby, with lawns and greenery as far as the eye can see, blended with Italian, Moorish and Spanish architectural influences. Picture this: statuesque columns leading to the ceiling arches are reminiscent of a grand church and a baby grand piano sits alongside floor to ceiling French windows and begs to be played. Although leaving the lobby might be tough, there's much more to explore here. For dining there are four excellent options, with each one better than the next: award-winning Palme d'Or, the Italian courtyard restaurant Fontana, casual al fresco Cascade Grill, and the 19th Hole that overlooks the stellar Biltmore Golf Course. The Cellar Wine Club offers 100 wines by the glass and an intimate club-like setting. The rooms and suites are adorned with European feather bedding and Egyptian cotton duvet covers, custom-designed furniture in the seating areas, tile flooring and picture perfect windows overlooking the grounds and pool. And if that weren't enough luxury wrapped up in the Biltmore, there's always the spa. The airy room filled with candles, comfy lounge chairs, beds and a gorgeous tiled spa tub, is a sanctuary for facial treatments, body scrubs, wraps, manis, pedis and all important massages. Complete the spa day with a luscious brunch, a long-time favorite for locals and guests. 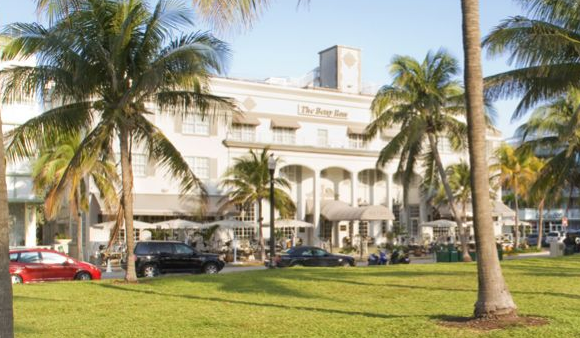 Sitting on the breezy porch of the Betsy Hotel on Miami Beach's most famous stretch of road- Ocean Drive-this hotel is a standout structure with a colonial non-Art Deco look and an environmentally conscious green program throughout the property, something they're proud to flaunt. It was added to the National Register of Historic Places in 1970 and this beauty deserves the recognition. While its traditional look is intact, it still has its South Beach touches. An inviting secluded courtyard pool beckons with an enclosed pool deck and plenty of amenities or there's the rooftop retreat deck for unbeatable ocean views. Plantation style shutters, black walnut hardwood floors, walk-in showers, comfy custom built poster beds, and sunny colors make the suites and classic rooms an inviting place to relax and take in the views; staring at the swaying palm trees across the street and seeing endless ocean views is why they call this place paradise. And when it's time to eat, BLT Steak is where it's at, with delectable items prepared by award-winning Chef Laurent Tourondel, whose skills have been praised by both Bon Appetit and Food and Wine Magazines. The name Four Seasons immediately conjures up images of a luxurious hotel filled with beautiful, well-to-do people, and the five-star Brickell Avenue Four Seasons does not disappoint. If anything, it exceeds those expectations with a fabulous location in the heart of everything that is pulsating in Miami, but offers the best of quiet serenity, too, making it the perfect place to stay for relaxing AND living it up. Of course, in a subtropical climate like sunny South Florida, the pools (yes, there are two) are one of the main attractions. They are surrounded by gorgeous private cabanas for stylish and comfortable relaxation, and the hotel's spa offers treatments in those cabanas as well as in-room service. The guestrooms are luxuriously designed and feature city and bayviews, so the balconies are the perfect spot to begin or end the day. If splurging is an option, take it to the top and stay in the Presidential Suite, complete with dining and living rooms, impressive bayviews, a large soaking tub and oversized separate shower in the master bedrooms, and comfy lounging chairs throughout. If you find the urge to get out of the hotel (although we don't blame you if you don't! ), it's easy to hit up one of Brickell's many nearby hotspots for some dancing and cocktails to top off the night. Using the available waterfront in Miami is always a plus and the Mandarin Oriental is one spot where ocean views are put to perfect use. Built alongside Biscayne Bay and with rooms, suites, dining and amenities (it's got the city's only five-star spa) to make other hotels envious, this place has it all...and more. Filled with floor to ceiling windows along the lobby floor, the bay views are unbeatable and breathtaking. They're visible from just about any vantage point. Head upstairs to the room floors and find luxurious suites that feature fully furnished living rooms with hardwood floors, area rugs and a city view visible through sliding glass doors that lead to a sprawling balcony. 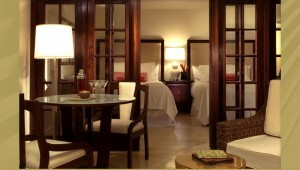 The spa suite has a spa tub that towers over the hardwood floors, and is perfectly named the Spa Serenity Room. For great grub, grab a bite indoors or out at the casual Cafe Sambal or something fancier at the signature Azul Restaurant. 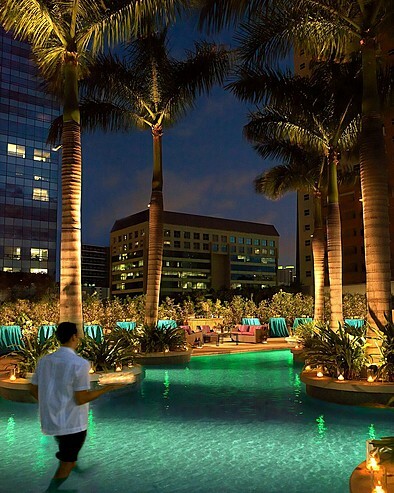 For a bit of relaxation, swing on a hammock by the resort's private beach and nearby Brickell offers all the nightlife necessary with bars and nightclubs everywhere. Others may come and go, but the Delano is the hotel that set the tone for what has become hip and happening in the South Beach scene. That pool, ohhh that pool, sets the standard for the rest of what represents "livin' it up" in Miami. Sitting beachfront and a stone's throw away from Lincoln Road and its thriving nightlife, Delano is simply where it's at. Inside, the place is decorated by room so that each area provides a different experience. 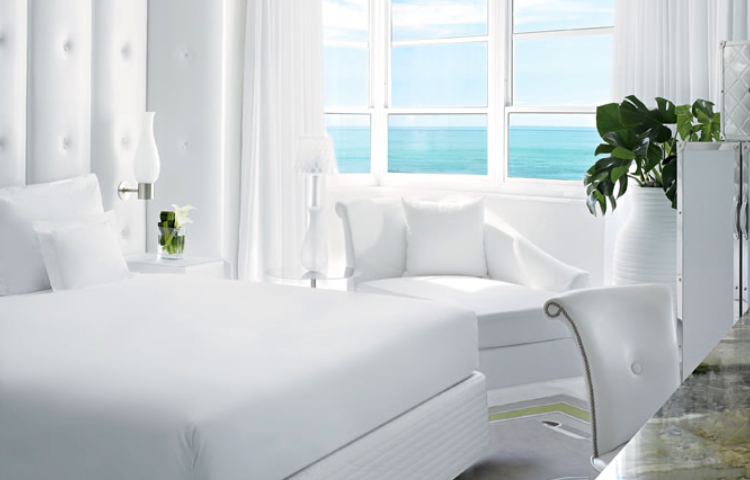 White is by far the predominant color with guest rooms awash in the crisp, clean hue, from the luxurious penthouse to the more subdued, but still uber cool, rooms and suites. A rooftop spa offers a 360 degree view of nothing but turquoise ocean as far as the eye can see. And of course, stay for some great nightlife and dining. After all, there's the classic Blue Door, the hotel's original and award-winning restaurant, along with Plat Bleu, and for cocktails and people watching (ahem, celeb spotting), there's the elegant Rose Bar. 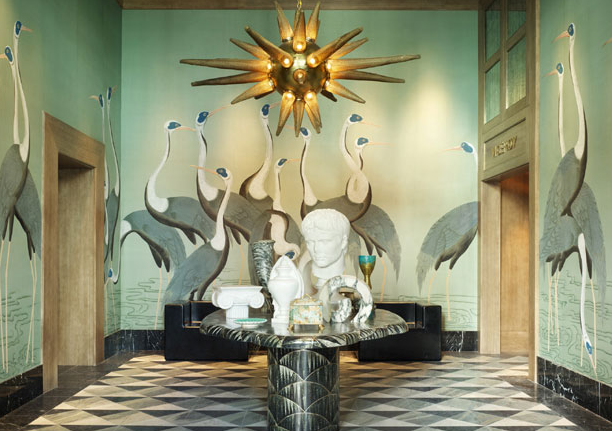 The importance of making a statement is evident at first glance of the Viceroy Miami. Bold statement pieces, like massive, Dali-esque face sculptures, greet both arriving guests and people driving along posh Brickell Avenue. The Viceroy is a unique boutique hotel situated in the heart of the Biscayne Bay- and takes full advantage of its prime location with fabulous amenities. There's rooftop partying and dining on the 50th floor's aptly named Club 50, which wraps around the hotel's pool and where deejays play the hottest tracks during happy hour and for the night owls. The 28,000-square-foot spa bathes guests in relaxation and luxury with a floating library, reflecting pond, hot and cold plunge pools and floor to ceiling windows showcasing dramatic bay views as far as the eye can see. The Viceroy Hotel is as unique, luxurious and bold as its decorative pieces. Across the Rickenbacker Causeway bridge, flanked by a breathtaking view of Biscayne Bay, lies the posh island of Key Biscayne. 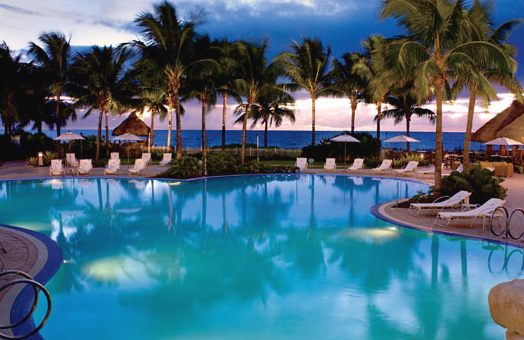 There's no better way to enjoy this land of luxury than at the Ritz-Carlton Key Biscayne. This island is a virtual playground for the rich and famous with its luxury residences, world-famous tennis stars everywhere (a little thing called the Sony Ericsson Open is held there), and PGA golfers playing the premier course Links at Key Biscayne. 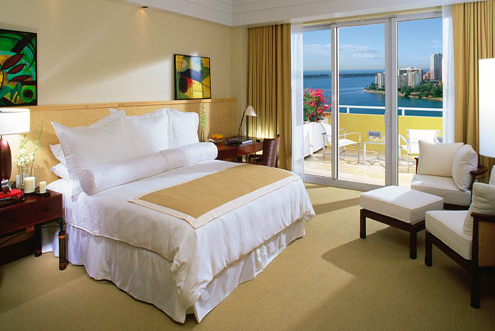 When all that activity is done, relaxing for a stay at the Ritz-Carlton isn't a bad place to lay your head down. This hotel is a best of the best with one of the Top 10 beaches, best restaurants, and best spas in North America. The resort's ambiance is modeled after an island paradise, making it a difficult decision whether to enjoy the view from a swanky room or drift off to the ocean breezes on the beach or by the pool. Stepping away from the Art Deco theme and chaos that is So uth Beach is The Setai, a hotel created to soothe the mind, body, and soul of all who enter and arguably the best hotel in Miami- by miles. A zen-like atmosphere is evident the moment one touches the Asian-inspired front door handles and enters the hotel oasis to a chorus of soothing sounds echoing from the sound system. Hard-working models, celebs, and professional athletes are among the regulars that come to enjoy the scenic Setai. Through the floor-to-ceiling windows in the lobby is a serene open-air courtyard with a centerpiece fountain surrounded by intricately placed palm trees, backless, cushioned benches, and a large wooden bar in the rear. The theme continues in the guestrooms where a minimalist approach, using jade and other Asian-inspired decorative pieces, contributes to an overall soothing experience. 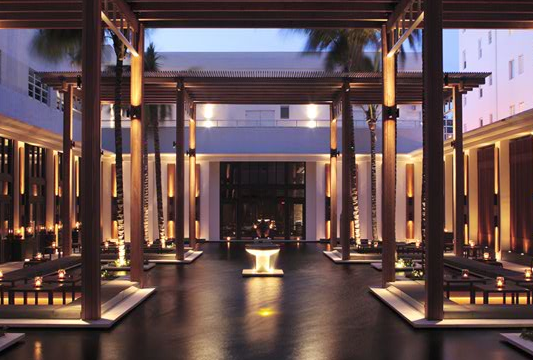 The Setai proves a trip to Miami can be as relaxing as Thailand.